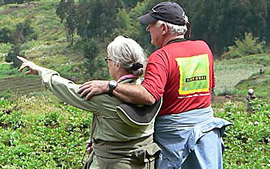 14 Days Rwanda, Congo and Tanzania great wildebeest migration in Serengeti national park crossing the Mara River and game drives in the famous Ngorongoro Crater, gorilla trekking in Rwanda or Uganda and mount Nyiragongo Volcano hike in Democratic Republic of Congo. Discover the epic wildlife and spectacular landscapes in Africa’s leading destinations. – Guided walking safari to the edge of Victoria Falls. DAY 2: Chimp Tracking and colobus monkey working. DAY 3: Canopy and Nature walks. After breakfast, you will go for a canopy walk within the forest expecting to enjoy the beautiful sights and sounds of different bird species such as the Rwenzori Turacos, Hornbills among others. You will also have a self guided walk after lunch around the nearby environment and the Kamiranzovu waterfalls. Dinner and overnight stay at (Day 2). After breakfast the tour guide will transfer you to the park headquarters for briefing by the park ranger as you get ready for the gorilla trek. Be part of history and see some of the mountain gorillas remaining on Earth, and nearly half live in the forests of the Virunga mountains in central Africa. These gorillas live on the green, volcanic slopes of Rwanda, Uganda, and the Democratic Republic of Congo — areas that have seen much human violence from which the gorillas have not escaped unscathed. Later transfer to Gisenyi – Lake Kivu. Transfer through Goma border post and enter the DR Congo. Drive for about 3 hours to Mikeno lodge or Bukima lodge for an overnight stay. Transfer to Kibati patrol post where the hike starts from—one hour drive from the Mikeno Lodge in Rumangabo. The hike takes 4 – 6 hours to reach the summit at 3470m (11,382ft). Hike to the top and you will admire the lava lake all the evening. Overnight: Cabanas at the top of the volcano. Early morning breakfast and then depart for game drives in Northern Serengeti with your expert guide. Enjoy the last day of Serengeti while looking out for more game, before flying out to Kilimanjaro airport for your international flight. In the mid-range category we have The Garr hotel and Lemigo Hotel.